Anyone have a lead on when last cold shots happen I’m not looking for deep freeze just curious as the last couple of freeze/frost events. The average last freeze/frost for Bham is April 1. Annoying self reply but the NAM brings the snow band through between 7 and 10 AM so commuting tomorrow will be miserable. Then sleet and freezing rain continuing all afternoon. GFS brings the snow through later and gets the wintry stuff out of here by 0z at least. HRRR is closer to the NAM timing but keeps the snow around longer. This is a pick your poison type thing I think. Hopefully the government closes tomorrow since there’s already a winter storm warning. I haven’t been out to measure but just guesstimating that we have about 2.5-3” already and more coming down. Starting to get icy on some of the roads. Glad the government offices closed today but my wife still had to work. Have fun on the winter side this severe rainy foggy floods side wreaks. I hear it has snowed in the deserts of Arizona and in Las Vegas this week. Mt. Washington is showing off tonight, setting an all-time February wind record of 171 mph. GFS showing a possible wintry event across the SE Monday-Wednesdayish. We’ve seen a lot of systems trend NW with time. We’ll see how this one goes...European is another bout of heavy rainfall for Alabama. 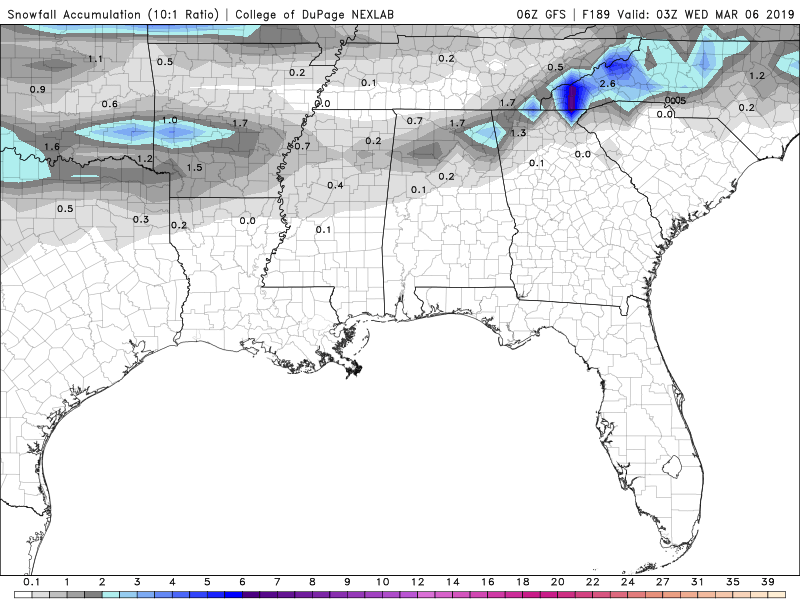 GFS was showing that same system dumping 4 inches of snow in South Mississippi yesterday so I’m not holding my breath. It will be a chilly start to March though for sure. So confidence is low in the forecast for Saturday-Monday which model can handle it this far out. I know some are probably showing winter mischief at least for north alabama for now I know no one is going to give it any credence and I don’t blame them wait and see definitely colder next week I’m sure. Another 1-2" tonight probably, because apparently mother nature has decided that I deserve to suffer. You're own your own dude. Lol. I am going to Unpin this thread. I hope we can safely say that we will not need this any further.